Yay! 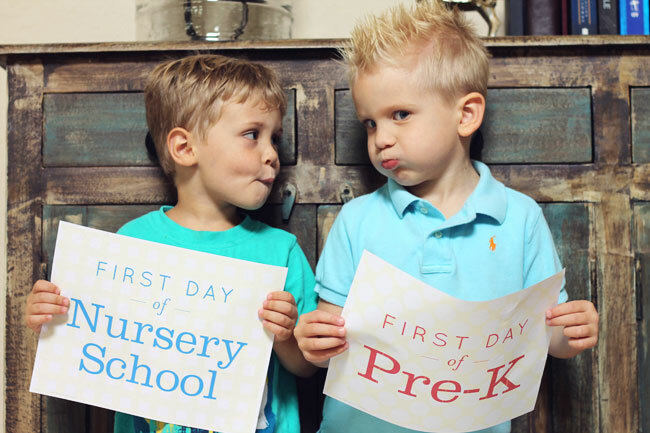 It’s THAT time of year – time to take back-to-school pictures! 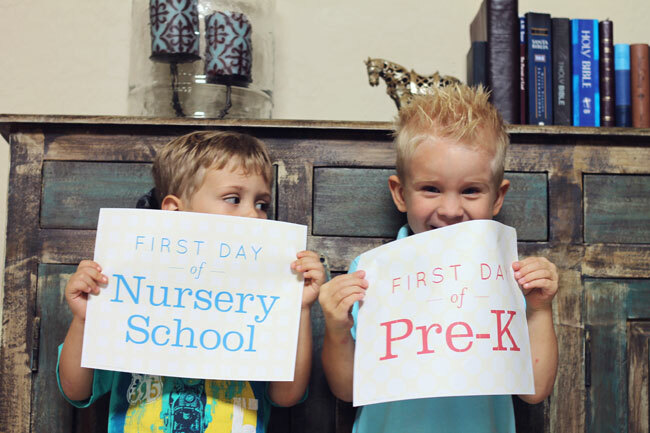 I love, love seeing the pictures you guys take with my free printable back-to-school signs! These adorable pictures just popped up in my inbox yesterday, thanks to mom Bridget. These little guys are BFFs, headed off to school this week. Aren’t they the cutest?! I designed these free printable signs exclusively for HowDoesShe readers – you can read more about the signs here. The set of signs includes all grades, on up through high school, so you can take special pictures every year! How to download: These FREE printables were designed by Heather from Chickabug (that’s me!) exclusively for HowDoesShe newsletter subscribers. To get the printables, sign up for HowDoesShe’s mailing list here. After you sign up, you’ll receive an email from HowDoesShe with a link to a special downloading page. For another fun free printable I designed that’s cool for school, check out my school lunch notes! Shop for personalized first day of school paper goods and printables here. Or, check out more back to school ideas on Pinterest or here on my blog! Whenever I click on the Download Now button in my email, it sends me to your homepage, and I can't see where to put the password. Can you please help? Thank you! LOVE these! just printed them for my 4th and 7th graders. I've been making signs myself each year since they were in preschool. Yours are MUCH cuter LOL! THANK YOU! Hello! Love your back to school signs! I subscribed but never got a welcome message to get the link! Hi Carli! I emailed you! Love your back-to-school-signs ♥ I signed up already but still can't download it yet. Do you mind sending me the link via my email? Thanks. I am unable to get to the page for sign-up to download. Help, please? Hi! I subscribed but did not get the link to download. I love your back to school signs and would love to print them out for my children. Any help would be greatly appreciated! Thank you! Hi Heather, I signed up for the newsletter, but I'm having a hard time downloading the back-to-school signs. Is there anyway you could e-mail them to me? Thanks so much! I am signed up for howdoesshes mailing list from last August. I wanted to download the first day of school printables and not sure how to do it now. I can't find my initial email from last year with the instructions. Thx! I also can't download. My kids start back 9/3 and I do these signs every year. Thanks so much! Please add me to your mailing list! Your stuff is awesome! Thanks for sharing!